Apple has included the ability to communicate via Bluetooth Low Energy (BLE) in recent iOS devices, including iPad 3 & 4, iPhone 4S & 5 and the 5th Gen iPod Touch. 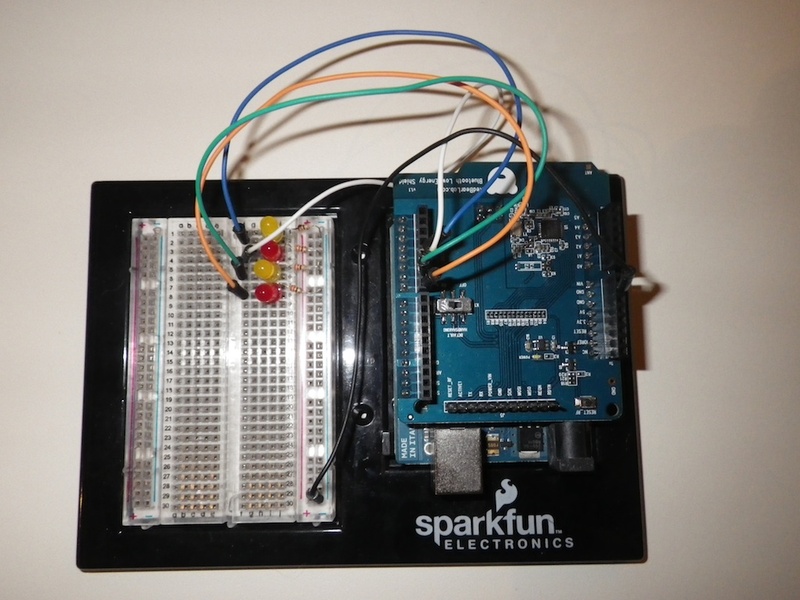 There is an increasing array of devices with which you can communicate (such as the TI Sensory Tag), but in this post I will be taking you through connecting and controlling an Arduino UNO board using a Red Bear Lab Bluetooth Low Energy Shield. 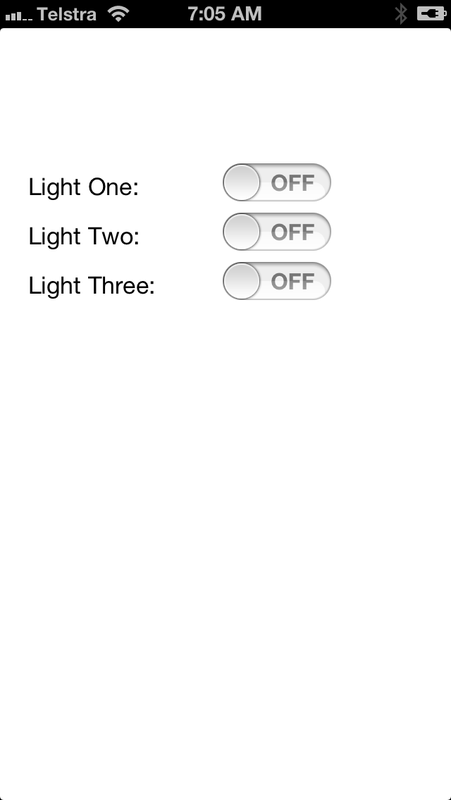 In this case we have a simple setup, four LEDs which we want to control from our iPhone. One LED will be used as a indicator when we are connected and the other three LEDs will light up based on the control of our iOS device. 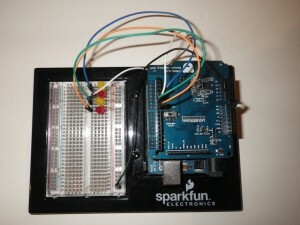 To begin with the board and the LED need to be wired to the Arduino Shield. I am using a Sparkfun prototyping board to layout the LEDs. The BLE Shield is on top of an Arduino Uno. The four LEDs are connected to pins 4,5,6,7 with a 330ohm resistor inline to avoid them burning out. I am not an electrical engineer, so I always need to test my setup before I attempt to get the Bluetooth communication going. To do this I had a simple script to simply turn the LEDs on and off. With the LEDs turning on and off we now need to implement the code to allow communication from the iOS device. The BLE shield will be polled continuously to see if any messages are received. We then give the BLE Shield a chance to process the connections. On the iOS side we will use the BLE framework files to communicate with the BLE Shield. 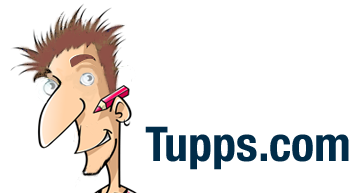 The complete project is available on GitHub. [self.ble controlSetup:1]; //Note the number doesn't seem to do anything! Two things have to happen before we can connect to the BLE shield, first waiting for the Bluetooth hardware on the iOS device to power up, then we wait for a BLE shield to connect. Once a connection to the BLEShield is made, the app calls connectPeripheral, causing the BLE shield to connect to us and being ready to accept commands. 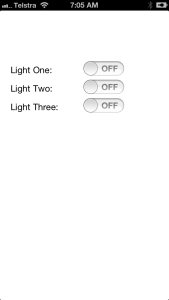 The final part of the iOS code sends a command to the BLE shield turning the lights on and off as the switch is changed. With that the iOS device can control the Arduino board. How can I pair my iOS device with a Arduino device via pairing code (UUID 128bit)? I want to get in touch with some kind of security here. Let’s take into account that i.e. String is saved on Arduino device and check with entered code on iOS device. How can this be implemented / done? I got this error message : ble.h not found.. I did download the files from github but couldnt figure it out. i tried using #include “ble.h” and but doesnt work. I download the file in my library. Which file should be included in the library when what needs to call eg. ble_shield or sort off? thanks..
Hello the BLE.m not work with Xcode 7.1.